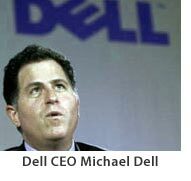 “Dell Inc. reported a sharp drop in first-quarter sales and earnings Thursday amid a 34% drop in PC sales,” David Goldman reports for CNNMoney. MacDailyNews Take: $12.3 billion to generate $290 million. Sheesh. Nice margins. Or lack thereof. It’s approaching “why bother?” time.